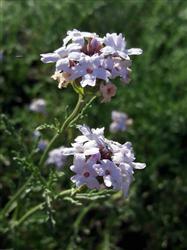 Paseo Rancho Verbena is a perennial sub-shrub which makes tidy 3' x 4' mounds with light pink fragrant flowers. Easy to grow and can bloom year round with once a month summer watering. This native verbena works well as a container specimen or planted in dry borders and is great for attracting bees and butterflies to the garden. This selection was introduced by Rancho Santa Ana Botanic Garden.